Let’s face it: email is not dead. Despite the media hype, it’s very much alive. They say it’s the age of Instagram, SnapChat and Facebook now. I couldn’t agree more – they are definitely effective for approaching consumers. However, when it comes to business communication, email marketing is here to stay. Chances are your day at work still starts with checking your email. The number of messages invading your inbox has grown substantially since email’s early days. Thus, getting customers’ attention is a bigger challenge now than ever. With this in mind, the question is not whether to employ email marketing as a channel, but how to do it right. Here are seven tips on how to get more eyeballs on your emails that we’ve learnt at Chanty through trial and error while promoting our business messenger. It’s a catchy subject line from one of the emails I’ve received and couldn’t help but open. It was about the end of the year, of course, but four simple words got me curious enough to click through and see what’s inside. Why do you open some emails while dragging others to the Trash folder? In most cases, it’s the subject line that makes or breaks your decision. Luckily, the majority of subject lines dominating a customer’s inbox are quite boring. This gives you a perfect opportunity to break through the noise by coming up with a line that stands out. If you need ideas of creative, standing out or even bizarre email subjects, check out this Hubspot article. Numbers and emojis are still a great way to stand out in the stream of ordinary email subject lines. Luckily, popular email marketing softwares (e.g. MailChimp) let you add emojis both to your emails and subject lines. Buyer persona along with its needs and pains has been the talk of the town in marketing community for a long while. 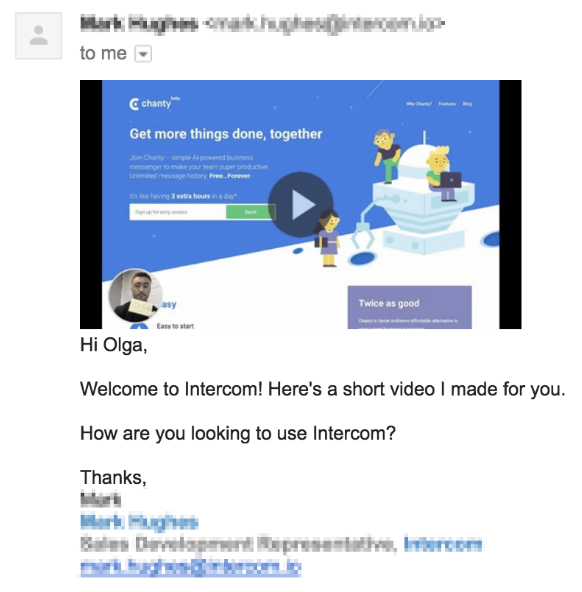 The individual approach won’t go outdated any time soon – the more granular, trigger-based and personalized emails you send, the more they’ll resonate with your audience. One of the excellent, but extremely time-consuming ideas is sending out emails with personal videos. E.g. an app like Bonjoro lets you record and send individual welcome videos to newly signed ups. Customers’ attention spans gets shorter each year thanks to the deluge of information they have to deal with on a daily basis. Therefore, avoid the long sentences, complicated words and plain text email layouts. Make your emails fun, easily consumed, and attention grabbing. This is when images, gifs and even jokes can be quite handy. 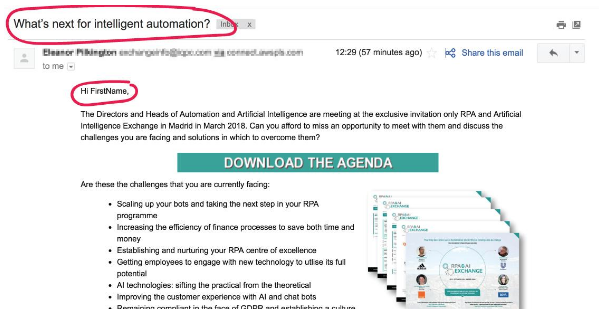 If your target audience is known for using GSuite, implementing One Click Actions could help your transactional messages stand out in the stream of email subject lines. Moreover, it works as a call to action and encourages users to ‘Open Discussion’, ‘Reset password’ and more without even opening an email. The average email open rate for internet and telecom companies is 40%. There are hundreds of reasons why the remaining 60% didn’t open your email, but that shouldn’t stop you. Rather than giving up on more than half of your subscribers, send that message again, but with a different subject line. It’s that simple. 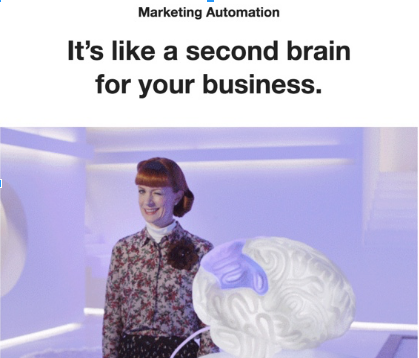 Email marketing is alive and well, despite the difficulty in winning over customers’ attention. However, with a right approach, you can still stand out and get your emails opened and read. Craft your message for the needs and pains of your target audience, stand out with creative and attractive subject lines, and add some personality and even humour into your text. Don’t forget to experiment, test and optimize. Looking forward to your comments if you have questions or have a few more tips to share. Good luck with your email marketing! email is not dead. Despite the media hype, it’s very much alive. They say it’s the age of Instagram, SnapChat and Facebook now. I couldn’t agree more – they are definitely effective for approaching consumers. However, when it comes to business communication, email marketing is here to stay. hahaha this is great. Email really helps you breed customer loyalty and takes engagement to a whole new level.